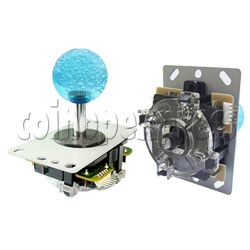 Superior joystick (45mm bubble top) is the one of best sellers in mainland which offer in market price. It designs in same construction of super joystick but in a bigger size. It is made of high quality material, wear-resistant. Standard flat mounting plate with elegant crafted is not easy to scratch. Complete with wire and 5 pin connector which sets up on machine without melding work. Screw in 45mm bubble top, you can refresh your panels by various color top ball.